When the Church Hurts You. I was 10 years old the first time I saw the ugly side of the body of Christ. The first time I saw the hypocrisy, the deception, the selfishness, the ill intent, the back stabbing. It absolutely, 100% shaped who I am today. Honestly, it's a miracle my older brother and I were able to understand that what we saw was not a reflection of Christ, but a reflection of the brokenness that exists even in those that follow Him. 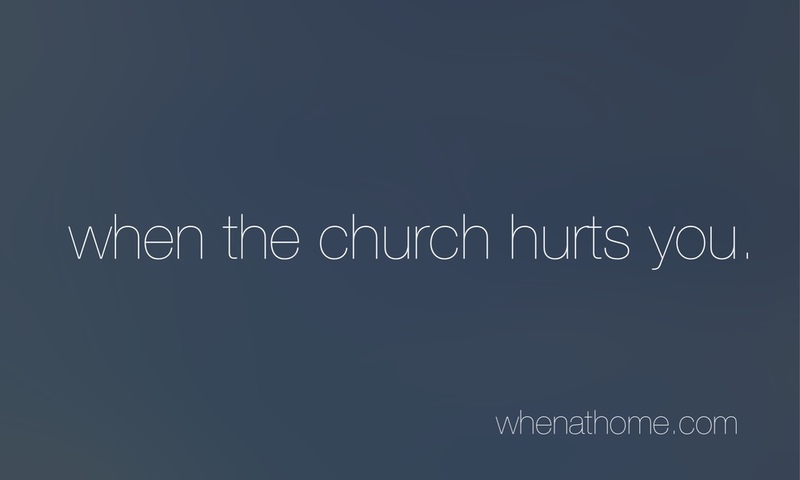 There were several more times throughout my life when people in the church hurt us. Betrayed us. Stabbed us in the back. Sometimes it was directed towards my parents, sometimes it was directed towards me or Zach. Sometimes it was enough to let us know we were no longer welcome in that area. Sometimes it was just enough to cause a few sleepless nights and then it was over. Sometimes it was caused by people we hardly knew. Sometimes it was caused by our family. There's a unique kind of pain that comes with being hurt by a brother or sister in Christ. The trust that exists between believers is not easily broken, but when it is, it cuts deeper than I can ever understand or explain. Sometimes you stay to fight it out in hopes that some kind of reconciliation can be made. But sometimes those people want nothing of reconciliation and their only desire is to continue to hurt you, continue to teach you a lesson, correct you, or make sure you know how inferior you are to them spiritually. When that happens, you run...far...far...away. We've done it. Several times. Because some fights aren't worth fighting. Sometimes your family's hearts are more important than trying to be the bigger person. So when the church hurts you, take a deep breath. Realize that the problem isn't God, and isn't the Church, it's people. Accept that you've done your share of hurting as well. Forgive. Reconcile. Do everything you can to make things right, but if you can't, get out. Don't try to be the better person and stick around to prove a point. I've seen that happen and it doesn't work. It's emotionally draining, physically exhausting, and your family and marriage might suffer. If you've done all you can do, move on. Don't carry the weight of the pain with you, just forgiveness. Truly forgive whoever wronged you. The last time I felt the familiar stab of betrayal from a fellow believer, the pain was deep. Raw. Excruciating. It left a big empty space in my soul where bitterness and anger soon made their home. But those emotions were just as familiar as the pain and I knew I didn't want anything to do with them. I shed a few tears and quite literally said, "Screw this." I refused to let that person have any more of my heart. Not even the angry parts. They weren't worth my sleepless nights, my angry journaling, and my prayers of damnation. At some point, you just have to accept that a jerk is just a jerk and you have to let a jerk be a jerk and not let it affect you. Because your heart is worth more than whatever you think you might accomplish by harboring anger towards them. I could tell you all the ways I imagined their downfall. All the ways I cursed them and questioned their relationship with Christ to the point of believing that they were in cahoots with the Devil (if not actually him in the flesh). But I won't tell you all of that. I'll just tell you that the next time I saw this person (years after the jerk was a jerky jerk face) , I looked into their eyes and had nothing for them but a smile and a hug. I HUGGED THEM. I walked away feeling so ... free. That's when I knew that I had truly forgiven and that the burden of the situation was no longer mine to carry. I have no anger or resentment or bitterness. As a seasoned grudge holder, this is kind of a big deal. Forgive. Move on. The church is a broken reflection of the Savior and the measure to which you forgive will be the measure by which you are forgiven. Someday it could be you holding the handle of the knife, and you'll want the grace and forgiveness that you may be presently withholding from somebody else. Don't carry the weight of someone else's mistakes. Find safety. Find healing. Tend to your wounds and the wounds of your family, but don't dwell there.